Grange car sales were proud members of the trading standards fair play charter from 2002 - 2011 when the scheme unfortunately ended. WHAT IS THE FAIR PLAY CHARTER? It is often difficult for consumers to know whether they are dealing with reputable traders who are trying to operate in a fair and honest way or whether they are dealing with one of the small proportion of rogue cowboy traders. In an attempt to address this particular problem, the Trading Standards Services in Greater Manchester have introduced ”Fair Play Charter,” A voluntary registration scheme for traders. Trading Standards Authorities cannot approve or recommend the services offered by business but traders who are committed to trading fairly and honestly may apply to join the registration scheme and sign a pledge that they will comply with certain terms and conditions. 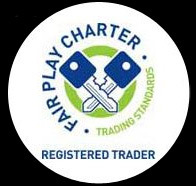 Business that can demonstrate their commitment to fair and honest trade may have their applications accepted and may display the Fair Play Charter Logo on their advertising. The first business sector to be introduced to the charter is the retail motor trade, incorporating not only retail sales but also repairs, servicing and the supply of parts and accessories.